MILAN – Profit at Italian carmaker Fiat more than tripled in the first quarter as Chrysler Group, its U.S. unit, gained market share on demand for its 200 and 300 sedans and helped offset falling revenues from mass-market car sales in Europe. Earnings before interest, taxes and one-time items, which Fiat calls trading profit, surged to 866 million euros ($1.14 billion) from 251 million euros a year earlier, the carmaker said. Sales more than doubled to 20.2 billion euros. Group revenue for both Fiat and Chrysler was 20.2 billion euros for the quarter. Without profits from Chrysler, Fiat would have just broken even in the quarter because of volume declines in Europe, compared with a trading profit of 251 million euros ($330.92 million) in the first quarter of 2011. Despite revenue in Europe falling by 13.1 percent to 4.5 billion euros, Fiat said it was on track with its business plan and confirmed all of its targets for 2012. The results show Fiat-Chrysler continues to be a "two-speed" company, with sharply different performances between the Italian and U.S. units. When Fiat took management control of Chrysler in 2009, analysts said the U.S. automaker would be a major drag. Instead it has become Fiat's chief source of strength. "Another positive quarter - built on sales gains that have surpassed the industry average - is affirmation that the Chrysler team is maintaining its focus," said Fiat-Chrysler CEO Sergio Marchionne in a statement on Thursday. "To say we are satisfied over all would be a stretch, but we are at the upper end of anybody's reasonable expectations," Marchionne said, adding that he was unhappy with pricing pressures faced by Fiat's top-selling Panda model. Marchionne is counting on Chrysler, which was consolidated into Fiat's results in June 2011, to propel profit for the group. 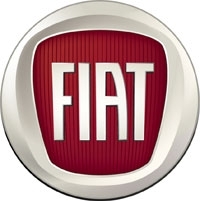 Fiat's net industrial debt was 5.77 billion euros, a tad lower than the 5.8 billion analysts were forecasting, while the group's cash cushion rose to 21.4 billion euros from 20.7 billion at the end of 2011, with 12 billion related to Fiat excluding Chrysler. In Latin America, where Fiat is a leader in Brazil, revenue rose to 2.57 million euros, while trading profit fell 50 million euros to 235 million, as price pressure from imports by other carmakers bit. The company sees an improvement in pricing conditions coming later this year. Fiat currently owns 58.5 percent of Chrysler, and Marchionne, 59, plans to merge the two manufacturers to boost sales to more than 100 billion euros by 2014. Fiat shut down a factory in Sicily at the end of last year and has frozen new investment in Europe and postponed the introduction of new models because the company doesn't anticipate a demand recovery until at least next year. Marchionne sees a "painful" restructuring needed for European carmakers, including plant closures and job cuts, to reduce an estimate 20 percent excess of capacity in the region, he said last month. The debt crisis in Europe led Fiat Group's deliveries in the 27-member EU states plus Switzerland, Norway and Iceland to fall 20 percent in the first quarter to 217,434 vehicles, industry association ACEA said this month.